The biggest WordCamp in the UK to-date was an unforgettable event! 600 attendees, 65 speakers over 3 days, WordCamp London 2015 was a great weekend spent developing with friends old and new! A WordCamp is an informal, community driven event organised by a local team of volunteers with support from WordCamp Central (and of-course the kind sponsors). The ticket prices are kept extremely low – and the whole spirit is always very ‘inclusive’ with a real spirit of collaboration. 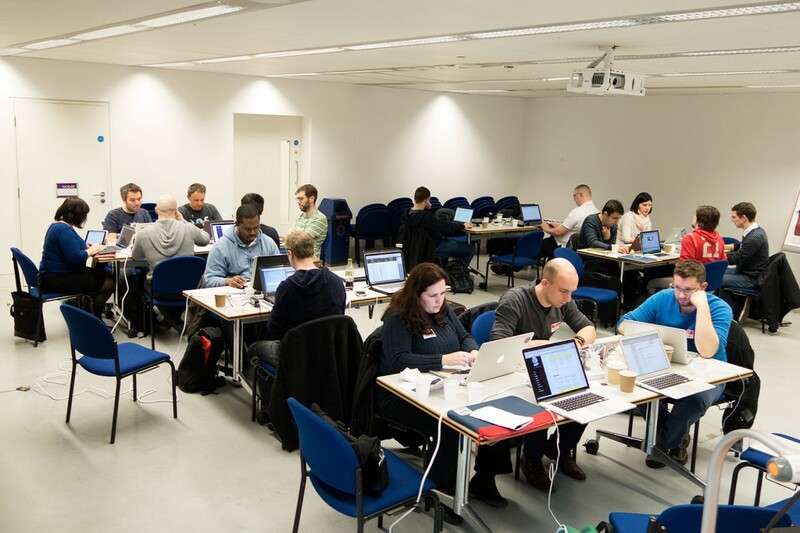 WordCamp London 2015 is the second one held in the capital following the first in 2013. I managed to catch the last few hours of the contributor day on the Friday before the conference started. I heading straight for the theme development room and was greeted by a number of friendly Automatticians and theme developers all digging into theme reviews and core theme development. It’s a shame my train didn’t get in a-little earlier so I could get a-little more done – but Tammie kindly got me back up-to-speed on how I can get back involved with the Theme Review Team after a few months break. Kudos to the team – they have made the process to request a new theme to review a-lot easier, (there is now a simple button when logged-in) thanks! With the on-going work to rationalise WordPress.org documentation and site structure I think things are really moving in the right direction to make contributing easier. Slack is also 100% better (and easier to use!) than IRC. Theme reviews and core theme development was just a small part of what was going on during the day. There were teams working on many different aspects of WordPress and associated projects such as BuddyPress. I’ve been to a couple of contributors days – they are inspiring for different reasons to the core event. You realise that no-matter what your expertise (or want to develop) – you’ll find a warm welcome and good advice on how to contribute and give a-little back. I spent the first evening with the UK Genesis group – some of who seemed slightly puzzled to see me there, as Genesis is a VERY popular WordPress theme framework (similar in purpose to Wonderflux.) Once it was squared-up that I was not a covert spy, I was kindly shown an extensive run-through of some features and a good discussion followed on why the guys like using it. My thoughts on Genesis are for a different post, but I’m a-little surprised with their non-standard template system and choice of admin options. I’m sure we barely scratched the surface – Genesis is popular for a reason and it was fascinating to see a different perspective on theme framework development. I’m extremely grateful to they guys that they were prepared to spend the time to show me the features of Genesis, and after a couple of drinks we all headed out for dinner together. Despite the tweets, I will not be converting away from Wonderflux… but will certainly be looking to deliver a plugin version of Flux Layout once I have it out of beta which I think will be of great use for Genesis responsive CSS layout design. My first day was spent between room 1 and 2 – featuring mostly business and development. Samantha Miller kicked it off with a good overview of bespoke theme development. She did a hell of a job to cover so-much in so little time, I’ve done a similar presentation and ran a-little short (not unusual!) The real takeaway was keep it simple – build only what you need. The WordPress REST API (WP-API) is the hottest topic in WordPress development circles and anticipation is at fever pitch around it after delays in completion. His presentation ‘Building themes with the WordPress Rest API’ did not disappoint, great amount of detail and much learned. We will wait with baited breath about a core developed theme using this technology that’s in development (Pickard) – but in the meantime, Jack revealed that he was actually using the API to run his presentation – genius! He’d build a quickie presentation theme called Pickard Present – available on GitHub. It did come with a big disclaimer about being very-much a proof of concept, but I’ve put this to one side to take a look at when I get a chance! Sadly Mike Little couldn’t attend (his Vagrant talk was also right at the top of my list for this WordCamp) – I hope all is well. Joe Hoyle stepped-in and gave a last-minute talk on the internal functionality and status of WP-API. This gave a great overview – and again was to a packed room. There’s no-doubt that there is a huge amount of interest around this – and worth noting is that the plugin (remember, this is going to end up in core soon!) has updated to v1.2.0 on March 24th 2015. Simon Wheatley closed the day off for me with a great talk on using URL structures to generate custom queries. I’ve done some work like this a few times in the past – and the real tricky part for me personally is building the regular expressions. As I just don’t work with them very often, it always takes me a while to play around with the syntax to get it right – REGEX is not fun! However, Simon highlighted Patterns as an application to help, along with the Query Monitor plugin. Day 2 was quite different for me – in the most-part it was more business orientated rather than coding. I kicked off the day with how to value price websites with Ben Furfie. Building quotes and pricing is one of the hardest things to do in this (or any) industry. It’s always great to share thoughts around this, and Ben highlighted a number of different quote building models and tactics that have helped him win business. Personally I struggle with applying the Value Pricing model – but there were some other applicable points for my business that validated some of what I use. Mark Jaquith gave a killer round-up for the pros and cons of various server caching and performance techniques. Over the years I’ve applied some of these techniques myself and seen good improvements in site performance. I think this is a really hot topic – no-one likes a slow site and with mobile visitors going through the roof you never know what sort of connection they visitor will have. Smart caching techniques can make a big difference. It will be worth keeping an eye on his Cache Buddy plugin, and also check out this fragment cache code of his – nice! I really enjoyed hearing Brad Williams talk on how he’s grown WebDevStudios over the years. It began as frank (and sometimes funny!) look behind the scenes of the early days. He then continued to talk much more around his business and team building ethos – much of which rang true with me too. Inspiring and honest, I got a-lot from this presentation. Working with people you like and are aligned to how you work is highly important – regardless of skills. Adrian Restantia gave an awesome run-down of his agencies creative process. With any process I think it’s important that there is a balance between resource required to complete and efficiencies produced from said process. It was clear that these guys knew what they were doing and one of the most inspiring things for me was seeing the animated talk-throughs on interactivity. Flat visuals are hard for clients to understand and often don’t do the vision justice. Adrian and his team produce video mockups in After Effects to approve site interactivity before one line of code is written… I have no idea why I’ve never thought of this before (as an After Effects user of over 15 years!) I realise this isn’t for everyone – but if you have the skills in-house, an animated mock-up could be produced quickly and amended very quickly with the client… code takes MUCH longer! Graham Armfield gave us an update on the often neglected area of website and WordPress accessibility. It’s clear that there have been some improvements in this area, however there is still much to be done! I’ve had the pleasure of seeing Graham present a number of times now – and what I’ve come to realise is that things change in this area and improvements are made. What were once accepted standards in the past do not now suit visitors with disabilities. A good example are access keys – once considered a ‘cool accessibility feature’ should not now be used. This one makes perfect sense – you should never hijack a users keyboard! Great stuff from Graham and lots to apply in the future. So much to take in and a big thank you! Well – I have 3 times the notes that I normally have after a WordCamp and there is so-much that I’ve not covered here. The organisers and volunteers did a cracking job on this WordCamp – and I’m happy to say that I feel it was the best WordCamp I’ve ever attended. There was a wonderful atmosphere and everyone I spoke to thought it was awesome! A big, big thank you goes to all involved. The presentations were well-planned, the venues was amazing and everyone was friendly and helpful. It’s hard to thank individuals – there seemed to be an army of volunteers and organisers in the special pink t-shirts (with the classic ‘localhost’ pun on the back – genius!). On a final note – something encouraging is that there are lots of local meetups going on around the UK. Myself, Rachel McCollin and Nathan Roberts organise the WordPress Birmingham meetup once a month, which is open to anyone to come along to. You can find out more about local UK meetups and whats happening around the UK on the new Slack channel: https://wp-community-uk.slack.com (update: just use your chat.wordpress.org email address to signup). I provide the perfect mix of creative design & proven technical production skills.